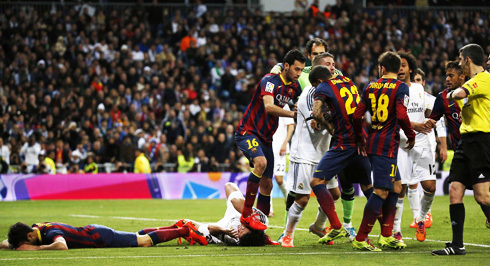 It has been one of the most intense Clasicos we've seen in the last years, but as it usually happens in games like these, there were tons of controversial decisions leaving one of the sides quite unhappy. 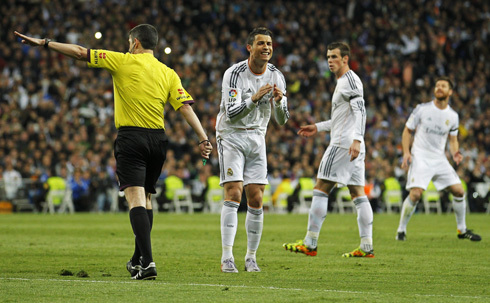 Several Real Madrid players such as Cristiano Ronaldo and Sergio Ramos, had no problems in coming out to talk with the press and charging against the Clasico's referee, Undiano Mallenco. Lately, every time Real Madrid and Barcelona clash against each other, the game tends to get an off-the-pitch extra-time in the press room, with players and coaches speaking their mind about the controversial decisions. Last night it wasn't any different from previous Clasicos and it ended up being Cristiano Ronaldo and Sergio Ramos who voiced Real Madrid's fury and indignation over Undiano Mallenco's performance at the Santiago Bernabéu. Real Madrid lost the Clasico by 3-4 and the surprising upset ended up triggering several harsh reactions that we'll be analyzing below... In the meanwhile, Real Madrid will visit Sevilla this Wednesday, while in England the Manchester United vs Manchester City will certainly be the big game of the week and it will take place the day before (this Tuesday), at Old Trafford. Cristiano Ronaldo: "We feel very sad, because after we made the 3-2 we were controlling the game and we ended up being unlucky in the way everything unfolded from that point onwards. However, the league continues and Barcelona are still behind us right now, with 9 fixtures left in the schedule." 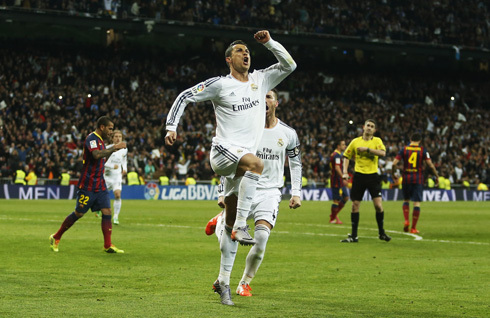 Ronaldo: "Coincidence or not, it's always the same thing against Barça. In my opinion, this referee doesn't have the right profile to be on a game like this. He made too many errors, a lot of small mistakes and it just can't be like that. They should have found a different referee because in my view, this referee doesn't have the quality to be on a game of this dimension." Ronaldo: "I don't want to blame the referee for the loss, but the truth is that if you look through the 90 minutes we've played, there were way too many mistakes favoring both Real Madrid and Barça, even though he ended up benefiting them more. When things are decided in this manner, it gets complicated... The referee must be more calm and the truth is that when we looked at him during the game, his face was completely pale! It can't be like this. A referee shouldn't be that anxious if he wants to be at his best and I think it led to him performing very poorly. We must keep on though and we're not going to drop our arms just because of a single game", analyzed the Portugal international. Ronaldo: "We can't throw the refeere excuse to justify the loss against Barcelona, but the fact is that he has been very poor. Most of the split decisions were given to Barça, little fouls, penalties, etc. It's extremely complicated this way and we basically were playing against 12...", pointed out the former Manchester United football player. Ronaldo: "Nobody wanted me to come here and talk to you, but I couldn't hold myself on this... Once again, I don't want to blame the referee for the loss, but he wasn't on the level a Clasico like this demands." Cristiano Ronaldo: "Everything that happened in this Clasico makes you wonder if there's someone up there not wanting that Real Madrid wins the league, or maybe just not wanting to put Barcelona out of the race title this soon in the season. If they had lost this Sunday's game, they would have been left without any realistic chances to still reach the first place. In a certain way, I can understand what they are trying to do... It's been 5 years since I'm here now and what I realize is that sometimes it isn't enough to play only on the pitch. We go through the same thing every year when we play against Barça, but regardless of that, I still have hopes that we will win La Liga at the end, no matter how many obstacles we have to face", outbursted the 29-year old. Who also ended up talking and criticizing the referee was Sergio Ramos, who got sent off during the second half of the game after an alleged foul on Neymar, when the Brazil international was already running inside Real Madrid's box. 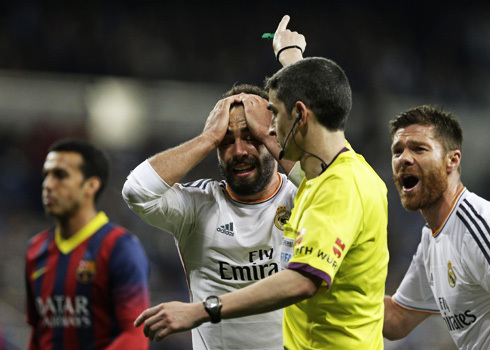 Sergio Ramos: "We hope that Undiano Mallenco doesn't referee any further Real Madrid game. You may call it coincidence, but the same things happen every time we play Barcelona, both here and in the Camp Nou. I didn't touch Neymar...", claimed the Spanish defender. Ramos: "If what they wanted to put everyone closer on the top of the league standings, then they've managed to do it. There are things against which we can't do much since they were already planned by others...", commented the 27-year old as he fed the idea of a conspiracy in Spain. Cristiano Ronaldo next game for Real Madrid will be against Sevilla for La Liga, on March 26 of 2014. You can watch Juventus live stream, Sevilla vs Real Madrid, Barcelona vs Celta de Vigo, Manchester United vs Manchester City live stream and Arsenal vs Swansea, all games provided from our football live streaming section.